Since the iconoclastic controversies of the eighth and ninth centuries, the visual arts have been the subject of much ecclesiastical discussion and contention. In particular, since the mid-1960s Protestant scholars and clergy have been paying more attention to the potential role of the visual arts in theology and liturgy of the Christian Church. As a result, numerous programs were begun under a variety of nomenclature, e.g., Religion and the Arts, Theology and the Arts, etc. 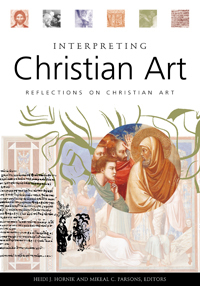 Most of the essays in this book were originally presented as part of the Pruit Symposium on “Interpreting Christian Art,” held at Baylor University in October 2000. The symposium provided the opportunity to bring together scholars, clergy, and laity who are interested in the question of how religious art can contribute to the life of the contemporary Christian community. The resulting essays are a rich fare in interdisciplinary exploration of Christian art by art historians, theologians, and biblical scholars. Essayists include Margaret Miles, Robin M. Jensen, Graydon F. Snyder, Charles Barber, Anthony Cutler, William M. Jensen, Paolo Berdini, John W. Cook, and the editors, Heidi J. Hornik and Mikeal C. Parsons.